Understanding what happens when light strikes a fashioned diamond is critical to knowing why diamonds show brightness, fire, and scintillation. 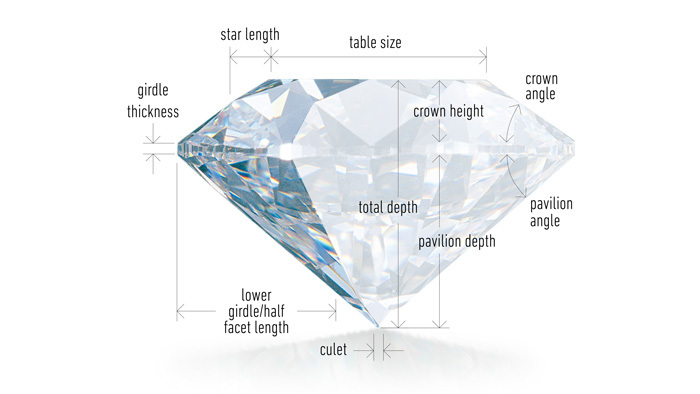 A diamond’s proportions determine how it interacts with the light around it. And its finish allows a diamond to show off its beauty to the fullest. When a light ray strikes a diamond, it either reflects off the surface or enters the diamond. If it reflects off the surface, you see it as a flash of white light, which is part of the diamond’s brightness—also called brilliance. Some of the light that leaves the diamond is bright white light, which adds to the diamond’s brightness. Other white light rays divide into colored flashes that are commonly called fire. Fire is the result of dispersion, which is the separation of white light into its spectral colors. The spectral colors are the colors of the rainbow: red, orange, yellow, green, blue, and violet. When the diamond, the light source, or the observer moves and the diamond catches the light around it, it sparkles with flashes of white and spectral-colored light. The sparkle is called scintillation. A finished diamond’s proportions affect its light performance, which in turn affects its beauty and overall appeal. If light enters through the crown of a poorly proportioned diamond, it might exit through the pavilion, making the diamond look dark and unattractive. Diamonds with good proportions, symmetry, and polish make better use of light, and will be bright, fiery, and sparkling. The diamond industry has long known that some proportion combinations make light perform better than others. In recent years, however, scientists in the GIA Research department and the GIA Laboratory have shown that there are many possible variations and combinations of proportions that will maximize brightness and fire in round brilliant diamonds. This research led to the development of the GIA cut grade for round brilliants, introduced in early 2006. The cut-grading process involves a combination of visual observation and careful, computer-based measurements. Moti Kashi Diamonds recommend selecting the highest cut grade within your budget. The reason is simple: of the Four Cs, no other characteristic has a greater influence on a diamond’s appearance. Our most brilliant cut, representing roughly the top 1% of diamond quality based on cut. The highest grades of polish and symmetry allow it to reflect even more light than the standard ideal cut. Poor cut: Diamonds that are generally so deep and narrow or shallow and wide that they lose most of the light out the sides and bottom. Moti Kashi Diamonds does not carry diamonds with cut grades of poor. 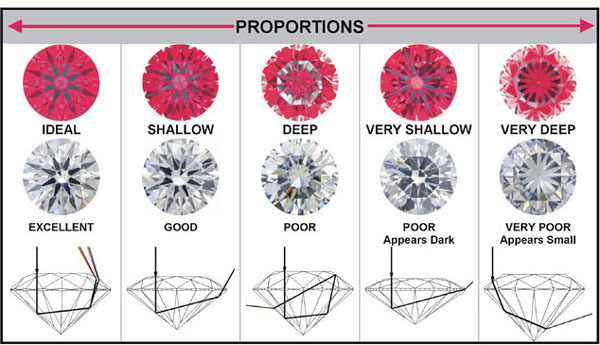 The chart below reveals what types of diamonds Moti Kashi Diamond customers are selecting. Modify the cut, carat and price, and the chart will display what others are purchasing according to the various color and clarity grades. By clicking on the percentages, our Diamond Search will generate a list of diamonds that correspond to those criteria. Questions about Cut or other aspects of diamond? Ask a diamond expert of Moti Kashi Diamonds for answers. Our experts will answer any questions you have, and if you like, search for diamonds on behalf that match you criteria.